Indulge in this delicious dessert that will remind you of your favorite ice cream flavor as a child! Line a 9" × 13" pan with waxed or parchment paper. Thoroughly mix together Graham Cracker Crumbs and butter. Evenly distribute the mixture in the pan and press to form a crust. Refrigerate the crust while you prepare the ice cream. In a mixer, combine heavy cream, sweetened condensed milk and Orange Cream Artisan. Mix on high speed until stiff peaks form, about 3 minutes. Evenly spread the cream mixture over the chilled crust and freeze until firm, about 4 hours. Mix Orange Zest Extract and remainder of melted chocolate. Drizzle over the ice cream. 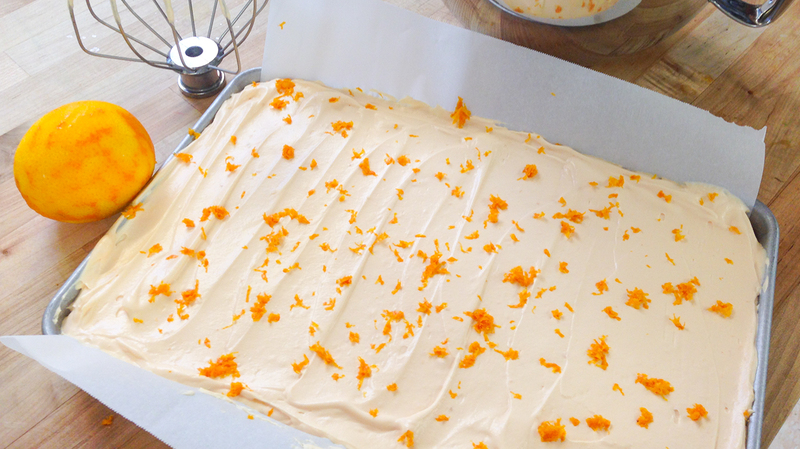 Follow by a sprinkle of orange zest. Slice in to small squares and serve. Store leftovers tightly wrapped in the freezer.